Our first match against St Vincents was a slow start for us. We managed to take the lead with one goal but unfortunately conceded in the last minute. The final score was a draw of 1-1. We started the second match against Allen B with good vibes and managed to get a goal in the early stages of the game. We were very happy to win the second game of the tournament 3-0. The final match of the tournament, we had to win! Christ the Saviour put up a good fight but we managed to keep a clean sheet and found the back of the net towards the end of the game. Relieved that all our matches were over, we just had to wait for the final results. Knowing we had done well, the results came out and just like that we had earnt ourselves a ticket to the London youth games! We came out with a good score of 7 points and came back to school beaming with pride!!!!!!!!!!!!!!!!!!!!!!!!!!!!!!!! 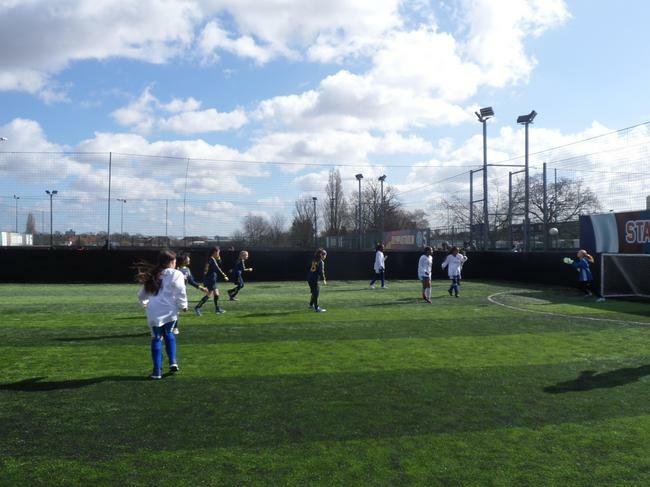 Today Fielding took 2 teams to this years Featherstone Girls Football tournament at Featherstone High School. The B team were drawn into a group of 6 teams and so had 5 games to try to amass enough points to get to the next stage of the competition. It was a tough group and a tough start for the B's as they lost their first 2 games 1-0 in games which had very few goal scoring chances either end. In their next game, the girls picked themselves up and pushed on to try to get their first win. However, even though they were on top for most of the game they couldn't find the back of the next and so the game ended 0-0. In game 4 and 5 it was the same story for the girls as they were unfortunate to end with 2 more 0-0 draws. That wasn't enough to qualify for the knockout stage of the main competition but their performances did see them through to the quarter finals of the plate competition. It was another close game but unfortunately the girls fell to another 1-0 defeat which ended their day in the competition. The A team were drawn into a group of 7 teams and had St. Anselm's to get past in their first game. It was a slow start for the A's as they narrowly won the game 1-0 with one of the final kicks of the game. After a short reflection the girls picked up in the rest of their group games as they went on to win their next 5 games scoring 17 goals in the process while conceding just 1! After a great morning the girls had qualified for the quarter finals and were up against Mount Carmel. After a nervy opening 2 minutes the girls found their stride and went on to win 4-0 to go through to the semi finals. St. Mark's were the team to try to beat in the semi's and the girls confidence seemed to be growing. Even though this was the toughest team we had played today, the girls won 3-0 to book a place in the final. Allenby had a great run of luck on the other side of the competition and were due to meet us in the final 2. Fielding were even better in the final and looked very comfortable from the first kick of the game and went on to win 3-0 to be crowned champions. Obviously it was huge team effort for the girls to have performed so well today as the team scored 28 goals and conceded just 1. However, special mention must go to Lily who played some of the best football she has ever played today as she pitched in with 16 of those goals!! Huge well done to both teams for showing the rewards that hard work gets you! 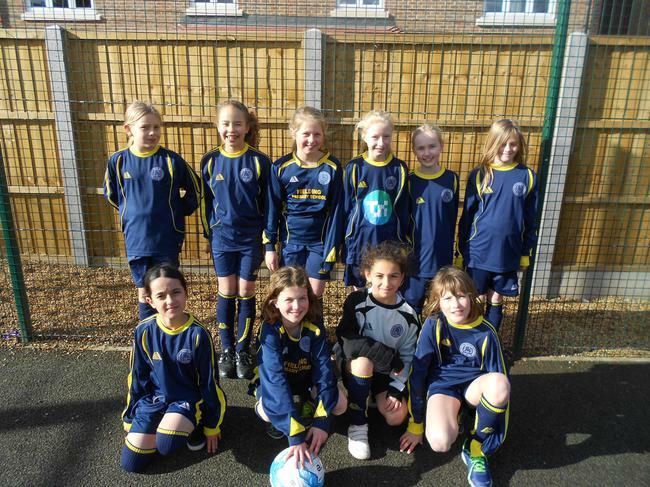 The girls football team were at Featherstone High School today for this years tournament. There was 19 schools entered for the competition with a spot at area finals up for grabs for today's finalists. Fielding were drawn into a group with Clifton, Derwentwater, Drayton Green and Berrymead B (who snuck a second team into the tournament through the back door!) First up for the girls today was Drayton Green in what was to be a frantic and crappy 6 minute game. The ball was barely out of Drayton Green's goal area but we could not score. Seconds before the final whistle blew Serafina finally managed to get the ball past the line for us and get us off to a winning start. 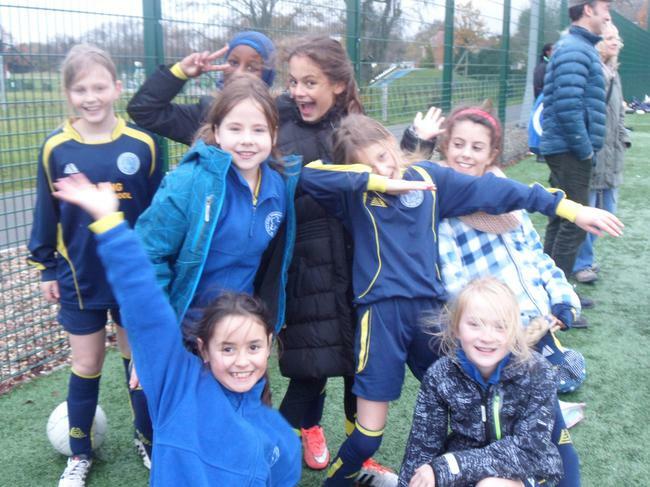 In our second game against Berrymead B the girls started to settle into their game a little more which resulted in a 2-0 win after 2 more goals from Serafina. The third game of the group was Derwentwater and again the girls moved up a level as they cruised to a 4-0 win with goals from Lily, Izzy, Oona and Serafina. In our final game against Clifton we knew we had already progressed to the next round but again got another comfortable victory as goals from Lily and Izzy got us a 2-0 win. The top 2 teams from each group progressed into the next round of games which we booked our place in as group winners. After lunch, competition restarted with the top 8 teams left in the tournament split into 2 groups. We were drawn with St. Anselm's, Berrymead A and Little Ealing. We knew the games would be tougher in the afternoon and so the girls picked up a level again as we beat St. Anselm's 4-0 with 2 goals from Izzy and 1 a piece from Lily and Oona. Berrymead A were our next opponents and again the girls played some fantastic football and demonstrated why other teams were starting to talk about us as they scored 4 again with 2 more goals from Izzy and 1 each from Lily and Serafina this time. The final game of the group was always going to be the toughest against Little Ealing. They were very organised and we had to be on top of our game to win 2-0 with 2 goals from Lily. Yet another win without conceding a goal ensure we went through the semi finals as group winners. We were drawn against Mount Carmel in the semi finals as they finished their group as runners up. Mount Carmel were obviously expecting a tough game against us as they had every player behind the ball defending and tried to hit us on the occasional counter attack. We could not break down a stubborn defense and so the game went into extra time. It was to be the same story in extra time and so the game went into the dreaded penalty shootout. After 3 penalties each, only 1 penalty was converted and it was converted by Mount Carmel. So we missed out on the final. We did have a 3rd/4th playoff game to play still and were up against the other losing semi finalists, East Acton. There was a subdued atmosphere surrounding this game but the girls got the job done and won 2-0 to at least go home with bronze medals. A small consolation on a day where everybody was praising the girls for being the best team at Featherstone. 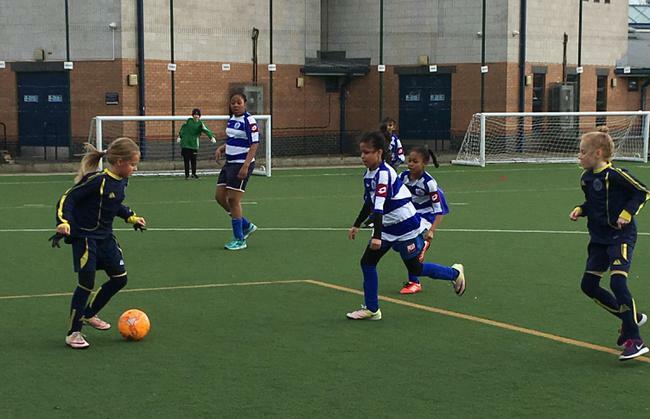 Well done girls, our attention now turns to the RSK Cup and the QPR Girls Cup. Today the girls football team went to Wembley....goals! 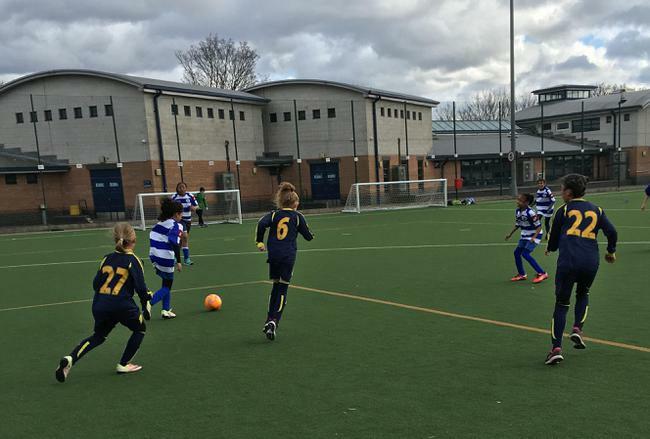 We were there for a brand new girls tournament being run by QPR which saw us alongside another 20 schools competing to be crowned number 1. The vast majority of the schools at the tournament were from another borough so we had no idea what to expect today and so just planned on being the best that we could be be. Our plan started well in the first game against Oliver Goldsmiths with goals from Daisy and Serafina getting us off to a 3-0 win. Our second game against St. Mary's was tougher as their defence were more organised. However, eventually we found our way through again with Daisy getting us started before Alessia came on to add a second goal and give us a 2-0 win. In our third game against St. Edward's we were starting to find our rhythm and were maybe flattered slightly by a 4-0 win with another 2 goals from Daisy and 1 each from Alessia and Chloe. The game also saw the emergence of one of our new younger players as Yitang, our only Year 4 of the day played well. Up to now Alicia had very little to do but did well to keep her concentration and gather up the ball when she was needed. In our 4th game against West Acton the girls were superb once again as Alessia scored 2 and Serafina 1 to give us another 3-0 win. The final group game of the day was up against a 'physical' Islamia team. Islamia had also won all of their games up to this point so we knew it was going to be our toughest game yet. Sophie played an absolute blinder in defence as she gave the opposition strike no time on the ball at all and refused to be bullied by some dirty tactics. Great play at the back allowed us to be more confident going forward and gave Daisy and Serafina the chance to score 2 and give us a 2-0 win to ensure we topped the group and went through to the quarter finals. Before the knockout stages there were some individual awards handed out in each group. 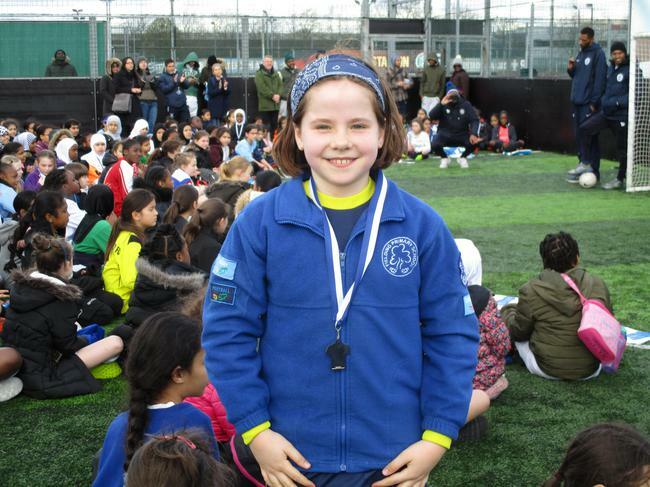 We were very pleased to see Daisy receive an award for 'goal of the group stage' and then Serafina get another award for 'player of the group stage'. That was fantastic for us before being drawn against Yeading in the quarter finals. Yeading were a very big team with most of them looking like they could be in secondary school already. Another great performance from Sophie at the back and also Oona in midfield made sure that Yeading had very few chances and again allowed us more freedom to attack. Serafina and Alessia stepped up again and gave us another 2-0 win. 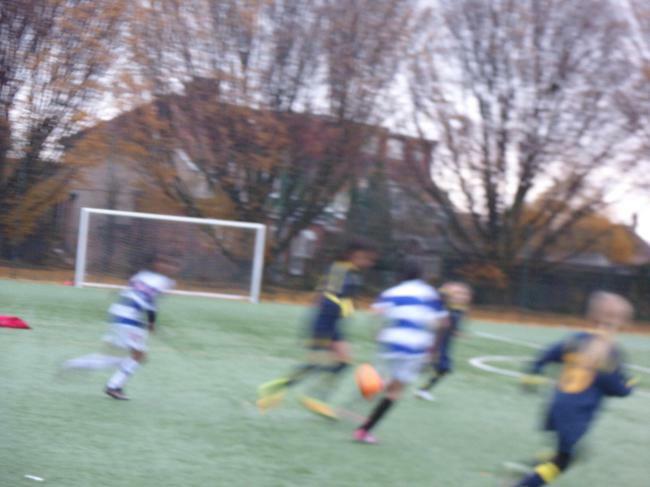 We were through to the semi final and were drawn against Harlesden who we were told had been playing very well. We had been too so we went into the game feeling confident. The game started at a frantic pace and we found ourselves 1-0 down within the first minute of the game. With plenty of the game left we just had to keep our heads up and keep going. It was very tough though with neither team able to create much. Eventually Harlesden had another break on against us and slotted home again. The girls kept going and going until the final whistle but we couldn't find a way through and went out of the tournament with a 2-0 defeat. It was a brilliant effort from the girls and you could see from the looks on their faces that they had put everything into it. We did play a 3rd/4th playoff game but you could see from both teams that that neither were happy to be playing the game. We lost 1-0 and ended the day 4th out of 21 schools. It was a fantastic achievement but we are now hungry for the win in the next years tournament!! Today the girls first team went to Featherstone High School to compete in the girls football area finals with a place at the London Youth Games the prize for the winner. We wanted that place but to get it we would have to get past Dairy Meadow, who beat us in the final at the last tournament and St. Gregory's and St. Vincent's the 2 Southall finalists. Our first game was against Dairy Meadow in a game which we knew would be very tough. The girls started brilliantly in terribly windy conditions and were piling on the pressure in a close 1st half. Eventually with a little bit of luck we had a breakthrough as Alessia got a chance and scored to make it 1-0. Concentration had to stay high in the second half as anything could happen with the wind. We were on top again for most of the second half and eventually forced a corner. Serafina swung it in to the near post where Izzy was running in to put the ball into the bottom corner. The whistle went and we started the day with a very comfortable 2-0 win over a strong Dairy Meadow team. Game 2 was up against unfamiliar opposition in St. Vincent's. Fielding had the majority of possession in the game but we were finding it difficult to create many scoring opportunities. Although we found ourselves on top for the majority of the game we couldn't find the net and the game ended 0-0. We had 4 points going into the final game of the day against St. Gregory's on 3 points. 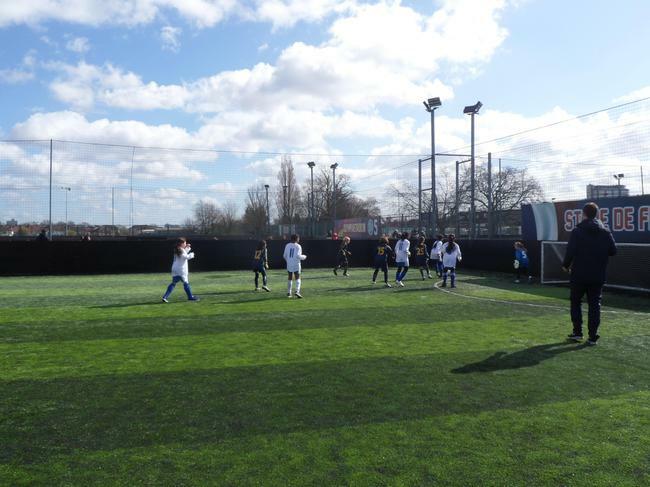 Dairy Meadow and St. Vincent's had finished their games and were both on 3 points each which meant if there was to be a winner in our final game, the winner would be crowned Ealing champions. The referee reminded both teams of this fact at kick off and we began what was a very tense and close game. There was very little in the game until a lucky break of the ball and a lack of concentration on our part saw the ball fall to their forward, who was just about shoot from close range when Serafina flew in to steal the ball. Shortly after that we broke into their half ourselves and saw a great pass into Alessia who kept her nerve to score and put us in the lead. This gave us about 2 minutes to hold the lead and secure a place in the London Youth Games...the girls did it!! Fantastic effort from every single girl in the squad today. At the final whistle they were all beaming and very much deserved the chance to represent the Borough of Ealing in the London Youth Games next month. Today we took 2 girls football teams to the annual Featherstone football tournament. This year there were 26 teams competing across a cup and plate competition. Our A team entered into the cup competition and our B team competed for the plate. 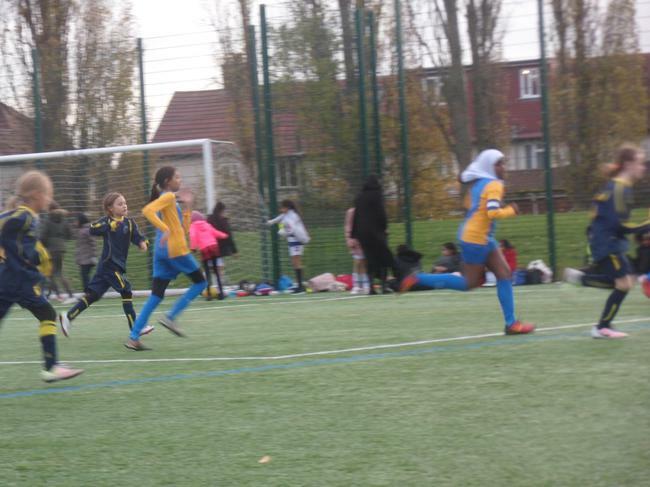 All of our girls have been committed to training every week and so were all eager to test themselves against other schools from Ealing and Southall. In the plate competition the teams were split into 2 groups of 7, meaning we had 6 games to win as many points as possible as only the top 2 teams in the group progressed to the semi finals. Our first game was Blair Peach and you could see from the first kick the girls were up for it. After a very exciting 6 minute game Fielding won 5-0 after 3 goals from Chloe and one each from Daisy E and Daisy S. Next up was St. Anselms and this proved to be a tougher game, with both teams failing to really get ahead. It was a tense game that finished 1-1 with captain, Daisy E scoring our goal. Our third game of the group was Berrymede and it was super Siham who popped up to score our only goal of the game as we won 1-0. Fielding vs St. John's was game number 4. This was scrappy encounter but it was unfortunately St. John's who got a lucky break to end the game as 1-0 winners. Our first loss of the day, but we were still pushing for the top of the group. We had to bounce back from our only defeat in a game against Dormers Well. We managed to keep a clean sheet, but unfortunately so did Dormers and so the game finished 0-0. Our final game of the group was against Allenby and we were determined to end with a win. 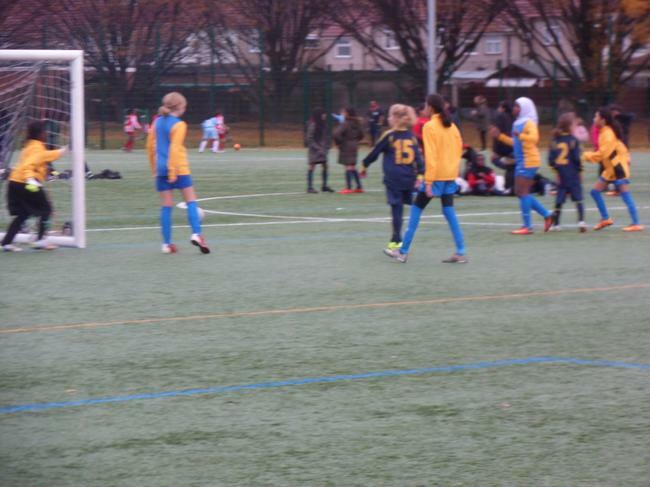 The girls worked extremely hard to secure a 1-0 win with Siham getting the deciding goal. So after 6 games and a record of 3 wins, 2 draws and only 1 loss we were expecting that we had done enough to get through to the semi finals. After a very long wait we had found out that we hadn't! We had finished third in the group, a single point behind St. John's and St. Anselm's who had both won 3 and drawn 3. After the disappointment of missing out on the semi finals we cheered up a bit when we found out we had a playoff game against 3rd place in the other group, Mayfield. This was a very close game which ended 0-0 and went straight into a penalty shootout to determine the winner. We lost 2-0 on penalties but were very pleased with our performances today. The B team were excellent today and should be very proud of themselves. The A team were drawn into a group of 6 in the cup competition, again knowing they needed results as only the top 2 in the group went through. Our first game of the tournament was against a very good Dairy Meadow side. Dairy Meadow had a lot of the ball in this game and we found ourselves constantly on the defensive, but our hard work in defence paid off as we earned a 0-0 draw. Our second game was against Little Ealing. 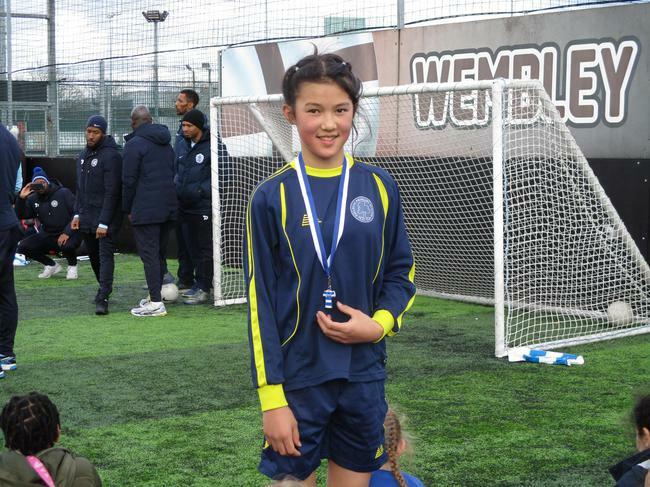 Little Ealing started well and scored 1st in a game that was end to end. The girls didn't give up though which allowed Izzy the opportunity to get a goal back which she gladly took. Game 2 had finished 1-1. Game 3 was Derwentwater and we knew we couldn't afford another draw if we wanted to go through. The girls were starting to learn that they had to take their chances when they came which led to Serafina and Lily both finding the net in a 2-0 victory. Mount Carmel were our 4th opponents of the day in a game which the girls had all told me that they had to win, there's something special about beating Mount Carmel! Fielding played some beautiful football in this game as they ran out 4-0 winners with goals from Izzy and Oona and 2 from Serafina. Going into our final game against Wolf Fields still unbeaten we were feeling good. Wolf Fields were a tough team to end the group against as we finished 0-0. So after the A teams 5 group games we had won 2 and drawn 3. Again there was a nervous wait, but eventually we found we had topped the group equal on points, but ahead on goal difference with Dairy Meadow. Finishing top set us up for a semi final clash against the other group runners up, Three Bridges. Fielding were unbelievable in this game as we constantly had the ball in the opponents half throughout the entire game. The huge pressure we put Three Bridges under didn't pay off though as the game ended 0-0. So it was straight into penalties with Alicia in between the posts for us for the first kick. Goal. 1-0 Three Bridges. Izzy stepped up first for us looking very calm. Goal!. 1-1. Three Bridges up again and again they scored. 2-1 Three Bridges. Lily stepped up and placed the ball down. Bottom corner. Goal! 2-2. The Three Bridges captain stepped up for the third and final penalty before sudden death. She blazed the ball high and wide. That left our captain, Serafina with the pressure of knowing that a goal from her would send us through to the final. The crowd went silent as Serafina started her run up. Serafina went for power. GOAL! 3-2 to Fielding and a place in the final. Dairy Meadow, our first opponents of the day had also won their semi final game to set up a mouthwatering final. Having made it to the final, both teams had earned the opportunity to represent the Borough in a regional tournament in February but we wanted to be there as champions! As expected from our first game against Dairy Meadow it was tough, but it was definitely 50-50 in the final, unlike in the first game. The game was on a knife edge when we had shot just wide to give Dairy Meadow a goal kick. A huge kick up field led to the ball bouncing straight to Alicia in our goal, but under pressure from the DM striker rushing towards her, the ball was fumbled into the path of the striker. 1-0 to Dairy Meadow. That wasn't the end of the game, we created chances to get a goal back but it wasn't to be. The final score was 1-0 to Dairy Meadow. A second place finish would have to do this year. Both teams should be extremely proud of their achievements this year. Everybody was impressed with our girls, even our parents got a mention as the event organiser praised the Fielding support as 'exemplary'! We will now look forward to February and representing the entire Borough in this years regional tournament. Well done all of Fielding Girls! PS. Apologies for the photo quality, the girls are definitely better footballers than they are photographers! 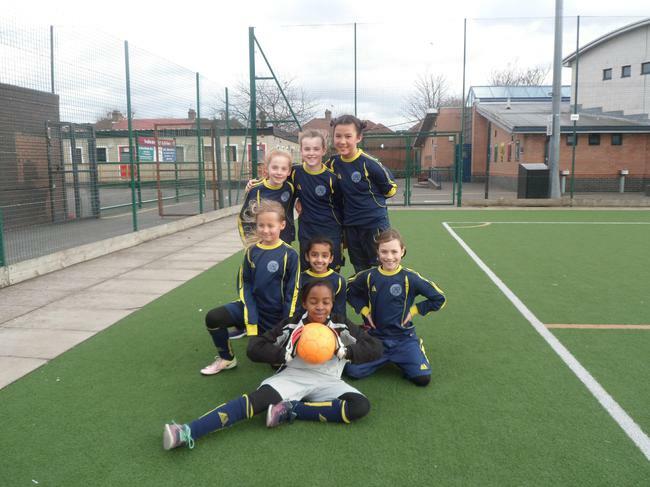 Today the Year 5 and Year 6 girls football team went to a 6 aside football tournament being hosted by Mount Carmel. A special thank you first of all to Mrs Dunne and Lucy's mum for making sure we could go to the tournament by helping us out last minute with travel to and from Mount Carmel! It was just a small tournament today with 4 teams, including St. Mark's, St. Joseph's, Mount Carmel and Fielding. 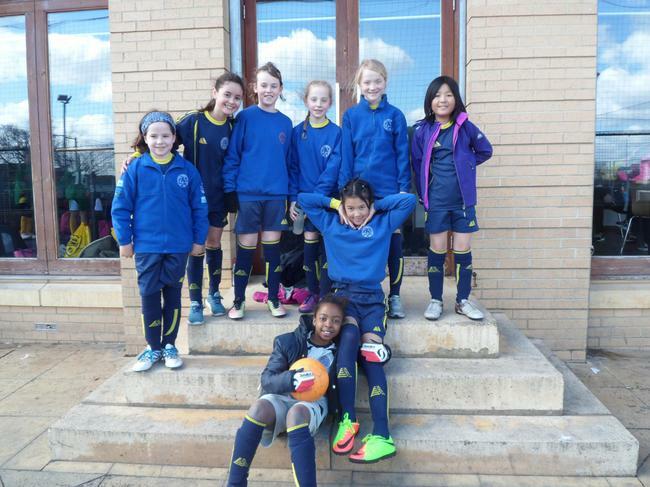 At the last tournament the girls team went to, we played some great football and were narrowly beaten finalists. Today we were hoping for another good day. First up we had a game against St. Joseph's. We started very slowly in this game and unfortunately ended up with a heavy 7-1 defeat. The girls were a bit shocked by the way the game started and then never managed to get back into it. The second game was up against St. Marks and gave us the chance to redeem ourselves. Mr McEvoy had a word with the girls before half term and reminded them that they could do better. 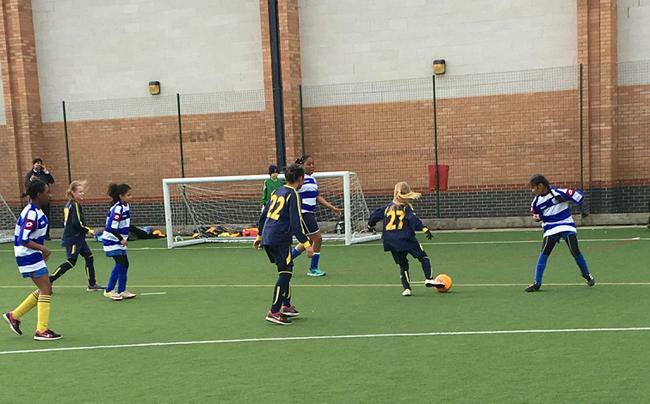 The girls responded and scored 2 goals past St.Marks in this game, however they also managed to concede 5. Lucy played a great game however, with Daisy L and and Sabrine supporting well. The final game was against old rivals, Mount Carmel. With an improvement in play between the first and second game, we were hoping for another step up here and a final game win. The girls were more comfortable in this game and were defending better as a team. However, for all of their great defending in this game, particularly from Alys at the back and Molly in goal, they struggled to create a lot of scoring chances at the other end. Eventually the deadlock was broken by Mount Carmel who went on to win 2-0 in a game which Mr McEvoy said should have ended as a draw. So today we ended up with a different result to the first tournament of the year, but the girls still deserve lots of credit for showing a great resilience to keep working their hardest in every game. Well done girls!! 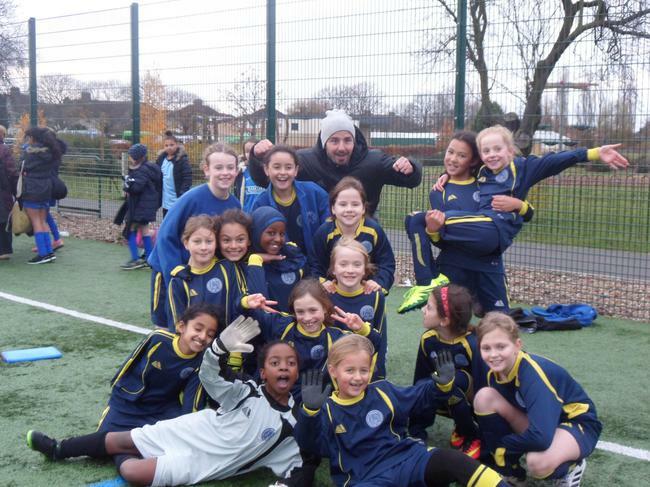 The girls football team travelled to Swift Road today to play in an Ealing schools tournament organised by Featherstone. 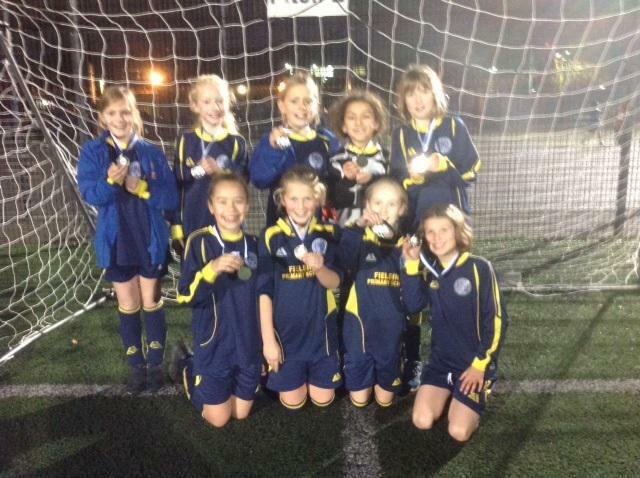 The girls did great and returned to school after playing some great football with silver medals around their necks. Fielding vs Hathaway was the first fixture of our day which ended up with a 2-1 win for Fielding. The girls played great together and have obviously learnt a lot from Mr McEvoy and Mr Henry at training. Great start. Next up for the girls was Dormers Wells. The girls tried their absolute hardest in this game but unfortunately they succumbed to a 2-1 defeat. However, there was still a big positive to draw from the game with Mr Henry commenting how impressed he was with the attitude of the Fielding girls. Every girl in the team kept their head up and kept trying whilst at the same time encouraging each other and reminding each other about the values of 'positivity' and 'unity' which we have learnt this year. Third game in the group was against Selbourne, who we are starting to get to know now after playing against them in boys football a few times already this year. This game proved to be a demonstration of their great attitudes as the girls put in a great performance to win 2-0. The fourth and final game in the group stages was an important one against Blair Peach. With 3 teams in the mix to finish top and go through to the final it was vital to get all 3 points. Although Fielding could still go through with a draw. It turned out to be a very close game which did end in a draw...1-1. However, with other results going our way Fielding managed to finish top of the group based on the superior number of goals they had scored. Fielding had made it through to yet another final and we haven't even got to Christmas yet! In the final Fielding were set to play against St. Anselm's who topped their group with a goal difference of +16!! This was going to be a hard game, but with the girls again reminding each other about our core values, they took to the pitch as a team and with positive attitudes. Mr Henry again commented on how proud he was of the girls in this game as they gave it their all to try to get the win, Unfortunately St. Anselm's managed to steal a goal and go 1 up and then managed to keep us out. The score finished 1-0 to St. Anselm's but as I'm sure you can see from the picture at the top of the page the girls were very happy with their silver medals!! As they should have been. Well done girls, you represented Fielding fantastically! !